Pain and problems after knee replacement underestimated! A considerable number of patients are not satisfied or pain free after partial or total knee replacement. About 1/4 to 1/3 of patients are not happy after knee replacement surgery. In the early years of knee replacement surgery it was the aim to achieve a pain free knee, which allows the patient to ambulate. Today patients`expectations are much higher than in these early days. 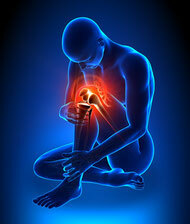 Most of the patients expect to have a pain free, stable knee with good range of motion. Besides daily activities a high percentage of patients also want to perform sports such as running, tennis, soccer or skiing. As cause of the problems a variety of diffferent reasons can be considered. Pain and problems after knee replacement- what are the reasons? The cause(s) of the patients`pain or problems are numerous. A single or a combination of causes can be responsible. Typically one distinguishes knee related from non-knee related reasons. In addition, all problems can be aggravated by psychological factors such as anxiety, depression, patient`s expectation or self-efficacy. Patients, which present to our specialised knee clinic "Painful knee replacement" need to undergo a detailed, individually tailored clinical and radiological diagnostic. Pain and problems after knee replacement- what can you do? Typically the main complaints and symptoms of the patients are complex. The diagnostical evaluation is difficult and should be performed in a standardised manner following a diagnostic algorithm. Only if the cause(s) of the problems are unambigously identified, there is a chance of improvement, whether treated surgcially or non-surgically. When should you seek a second opinion in our specialised knee clinic! In the case of persistent pain (> 12 months), stiffness or limited range of motion a second opinion of a specialised knee surgeon is indicated. In the case of infection (swelling, erythema, warm knee joint) an urgent consultation is necessary.